The same mentality that promotes secret schemes aimed at regime change abroad will be applied at home. Editor's Note: This article originally appeared at TomHayden.com. It is republished with the author's permission. While the first Cold War was fought against communism, a successor Cold War is steadily unfolding against democratic electoral outcomes unfavorable to America's perceived interests. Russian President Vladimir Putin's illegal occupation of Crimea has for now revived raging Western memories of Joseph Stalin's top-down incorporation of the former Eastern Europe. Lost in the new anti-Russian narrative, however, is the growing US pattern of ignoring democratic electoral outcomes where they are inconvenient, in the name of "promoting democracy." Ultimately this process of "democracy through intervention" reinforces bureaucratic authoritarian trends in both East and West. The thrust of this US foreign policy mirrors conservatives’ efforts at home to limit and divide the ascending multicultural American political majority. It should be remembered that Al Gore's election by a half-million vote majority in 2000, and his apparent win in Florida that year, did not prevent Republican mobs, Republican apparatchiks and Republican judges from forcing the Bush Era upon America. Many of those same forces are willing to do whatever is necessary abroad to thwart democratic electoral outcomes not to their liking. The United States must look beyond Mr. Putin. His regime may appear imposing, but it is rotting inside. His Russia is not a great power on par with America. It is a gas station run by a corrupt, autocratic regime. And eventually, Russians will come for Mr. Putin in the same way and for the same reasons that Ukrainians came for Viktor F. Yanukovych. This new Cold War is not all about communism taking over the world. It is more about returning to 19th century balance of power interests, borrowing the phrase John Kerry has used against Putin. It is about dividing up the spoils of the first Cold War among the triumphal capitalist democracies, as if Russia is defeated and short-lived. Pushing Western capitalism and NATO towards the habitat of the Russian bear was sure to touch off the current escalation, and worse may come. On both sides, the projection of a frightening external enemy becomes a tool for curbing domestic democratic dissent. Richard Holbrooke years ago declared that the Ukraine was part of "our core zone of security." Under that kind of thinking, the thaw in the Cold War inevitably would turn back to ice. George Kennan, the diplomatic architect of containment, wrote in 1951 as the First Cold War was hardening, "let us not hover nervously over the people who come after, applying litmus paper daily to their political complexions to find out whether they answer to our concept or 'democratic'..." Citing Kennan fifty years later, Russian history Stephen F. Cohen argues that Russia can advance towards democracy "only when its relations with the outside world, particularly the United States, are improving, not worsening. In increasingly cold war circumstances, its ruling circles…will never risk 'letting go'. That is why Gorbachev's anti-Cold War and pro-democracy policies were inseparable." The Revival of the "Sino-Soviet Threat"
Only last year the Obama administration's strategic thinkers were saying the First Cold War was over and urging a "pivot" towards China. The pivot itself, however, contained poisoning strains of the first Cold War's brinksmanship, especially in the American assertion of naval access to the South China Sea, the defense of Japan and South Korea against China, and escalation of cyber-warfare. Whatever the justifications given, it was absolutely predictable that these policies would appear as military encirclement to the Chinese. As with Russia, armed US forces were poking into China's ancient habitat. The ill-named "pivot" was more than a basketball move; it was a choice of military competition. The pivot would hardly promote greater democracy in China, a stated US concern. That objective could be promoted by an executive order banning US federal procurement of products made in Chinese sweatshops, but that would upset the Apple cart of the Trans Pacific Partnership, which corporate American wants as an economic complement to the new policy of military containment. A campaign against iPhones and iPads made for Apple and FoxConn by Chinese slave labor might arouse Chinese wrath but it would not be an escalation of the military stakes. While China and Russia disagree over the legitimacy of intervention in Crimea, there is no doubt that America's new Cold War policy has driven those estranged countries into a strategic alliance against the US. Once bitterly divided but now sharing a fear of encirclement by the West, Russia and China are collaborating on energy and weapons policies, and seek to formalize a multi-polar balance of global power against America and the West. Their combined authoritarianism will only grow as dissidents in both countries are accused of being Americans pawns. When Obama recognized the electoral victory of Egypt's Islamic Brotherhood in 2011-12, it was a historic opening permitting a peaceful political alternative to violent jihad for millions of Islamic believers. An underground organization, which suffered decades of torture and banishment, had achieved the option of a democratic path to power. It was natural and inevitable that the Brotherhood would carry scars of bitterness and paranoia from its years in exile. Nothing that President Mohammad Morsi did as president justified the violent coup by Egypt's generals in 2013. That coup was fervently desired by Israel and Saudi Arabia, whose pressures made Obama succumb. At first Obama appeared to recognize that the generals' action was an illegal coup, which would require the suspension of $1.5 billion in annual US assistance. But, given the slant of elite opinion, the political basis for Obama defending the democratic election of an "authoritarian" was a thin one. The Israelis and Saudis waged a furious lobbying campaign against Obama and on behalf of the coup. In the end, John Kerry pronounced that the generals were following an acceptable road map to constitutional democracy, and there the debate ended. In one of Kerry's more garbled sentences, the secretary of state said, "I think it’s important for all of us, until proven otherwise, to accept that this is the track Egypt is on and to work to help it to be able to achieve that.” One angry representative of Human Rights Watch, no defender of autocrats, concluded that the generals' coup set Egypt back about 100 years. The coup also reinforced the jihadist and Al Qaeda narrative that democracy is a hoax. In practical terms, it also worsened the Israeli-Palestinian conflict in which Morsi had become a mediator on behalf of Hamas. Where Morsi had permitted the smuggling tunnels between Egypt and Gaza to continue, the new dictators shut them down, closed the border, and declared Hamas to be a terrorist organization. While crippling Hamas, the new policies also have given rise to more radical jihadist attacks on Israel and a new insurgency in the Sinai desert. Israeli national security experts now say they need Hamas as a stabilizing force even if it is, "the best of bad options." Needless to say, no "democratic spring" has been planted as a result of these policies. The original Cold War was premised on a baseless "domino theory"—that any communist victory anywhere would cause the toppling of neighboring states. The new Cold War doctrine is that democratically elected nationalist or socialist leaders are new dominos threatening the fall of a US-controlled order. In the first Cold War, Cuba was the Soviet domino whose “fall” justified the dispatch of CIA and special forces across Latin America and the propping up of oligarchs, military dictators and regimes that employed death squads. These policies resulted in thousands of deaths and mass suffering, but in the end failed to prevent the collapse of dictatorial regimes through free and democratic elections across Latin America. Far from being defeated or isolated, the Cuban government eventually was recognized by every country in Central and Latin America. Despite these Cold War policies being irrational, Venezuela became the New Domino. Ironically, the Venezuelan revolution started in the same year as the fall of the Soviet Union, 1989, with the mass uprising known as the Caracazao against the increase in consumer prices dictated by the post-Cold War doctrine of neo-liberal economics. Those events, which left thousands dead or wounded, led to an abortive coup attempt in 1992 by Army major Hugo Chavez just as the Clinton administration was emerging amidst post-Soviet triumphalism. Clinton was so intent on implementing his post-Cold War "free trade" policies in Latin America that he might have missed the significance of Chavez's democratic election in 1998. That election was a turning point in the history of Latin America's recent revolutionaries, because it opened an electoral path to power where previous efforts had resulted in coups and assassinations. Until then, the Cuban Revolution's path of armed revolution and centralized economic development led by a one-party state was the leading model for wresting independence from Yankee imperialism. Previous electoral winners like Chile's Salvador Allende had been targeted for economic destabilization by the Nixon administration and military destruction by the country's right-wing generals. When Allende's defense minister Orlando Letelier and his aide Ronnie Moffett were murdered in 1976 in a Washington DC car bombing, then CIA-director George H.W. Bush issued a false statement blaming a Marxist plot. The murders actually were carried out by CIA-trained Cuban exiles as part of a continent-wide program known as Operation Condor. The Augusto Pinochet dictatorship carried out mass killings, opened the country to foreign investment and remained in power until the Jimmy Carter era, when a genuine Chilean democracy movement succeeded in winning a plebiscite on democracy. The Carter administration, holding aloft its banner of human rights and while defending against global attacks on American credibility, accepted the Chilean outcome to its credit. The American policy of non-intervention was crucial and marked a step back from the Monroe Doctrine. Hugo Chavez, a protégé and close ally of Fidel Castro, took up his platform of "21st Century Socialism" and became the winner of eighteen out of nineteen elections until his death in 2013. Nearly all observers, like those at the Carter Center, pronounced those elections to be fair and legitimate. Interestingly, the one election lost by Chavez would have vastly expanded his executive powers, showing that Venezuela's voters could impose checks and balances when they chose. But the United States was never comfortable with Venezuela's new democracy, and some elements were openly hostile. During the Bush administration, they played a covert role in the 2002 coup by discontented military officers and business leaders. When Obama became president, he cheerfully shook hands and bantered with Chavez and his then-aide, Nicholas Maduro, at a Summit of the Americas meeting. Unfortunately, Obama’s dinosaur adviser, Jeffrey Davidow, disparaged this brief rapprochement at the Trinidad summit. In the brief post-Cold War "unipolar moment," as the elites headily described it, there was no way the United States was going to embrace "twenty-first century socialism" even if was achieved at the ballot box. After all was said and done, Chavez maintained proper relations with oil giants like Chevron; but he wanted to share subsidized oil and natural gas with customers from Cuba to the Andes and even to freezing cities in the northeastern US. His social programs, which were wildly popular with the poor, were nothing more than a serious version of the Peace Corps' original vision of promoting literacy, medical care and community development to those in need. The spread of those ideals were a threat to certain privileged interests in Venezuela and the United States. The passionate embrace of these ideals by people of color, the indigenous and the long-suffering wretched of Latin America, was an even greater threat. The basic American concept of democracy could have included space for the election of independent social democrats or radical populists. But that was rarely if ever part of the American consensus on democracy, not since the beginning. The Federalist Papers warned against the danger of "a majority faction" composed of the vast multitude of colonists who couldn't vote, not to mention the native people. Each step along the path to an enlarged democracy—the Reconstruction amendments, women's suffrage, the right of workers to organize and bargain collectively, the voting rights act, court decisions on gerrymandering and reapportionment, the status of migrant workers—was hard-fought, bitterly contested and never fully accepted. Today's Republicans are feverishly trying to diminish the voting potential of millions of Americans who constitute that same "majority faction." To use Mitt Romney's derogatory term, why would those conservative Americans support the empowerment of all those "takers" on the state payroll in Venezuela? Twenty-first century socialism by the ballot box is unacceptable. Perhaps in the twenty-second century. The problem for the US elites was how to block the Chavez project without officially opposing democratic elections. One possibility was to suggest that "free markets" inherently were part of the "open society" underlying "free elections." This was an ideological premise smuggled into the doctrine of neo-liberalism. Under the banner of "free trade", the neo-liberals tried arguing against any government "intrusions" on the market such as state ownership, collective bargaining, food safety regulations, consumer or environmental protections. They achieved significant bipartisan success for this doctrine even though in theory is could it lead back to the free trade premise of slavery. The neo-liberal doctrine became challenged publicly and formidably after Latin America's progressive elections of the Nineties and the Seattle uprising—which led to such policies becoming more and more secretive, arranged behind closed doors, circumventing Congress, as in the case of the NAFTAs, CAFTAs, the pending Trans Pacific Partnership and the rest of the spawn of the World Trade Organization. Another critique of Chavez became popular with the media and foreign policy elite, one which would discredit his version of democracy by majority rule while leaving intact another notion of a proper, liberty and property-protecting democracy. Free elections were acceptable, in this view, but if they advanced authoritarian outcomes they were not considered free and democratic. Falling back on old racial stereotypes, Chavez was pictured as an authoritarian personality, a Latin American caudillo, or strongman, who was mesmerizing an illiterate horde of sheep-like Venezuelans into bestowing dictatorial powers on him through the ballot box. This "dictatorship through democracy" had to be stopped before it spread across the continent. Think tanks and foreign policy magazines began propagating two new qualifications on the democratic definition: first, that populism itself was dangerously undemocratic because it was based on machine patronage to working class and poor constituencies; and second, that Latin America should be divided between a "good left" and a "bad left," the difference being the state's role in the market economy. On the "good left" were countries that paid their debts under the mandates of the international financial institutions, or IFIs, and who opened their markets and resources to the big multi-nationals, even if that meant cutting government subsidies and social programs on a continent where the majority are poor. The "bad left" consisted of the countries where democratic elections had resulted in a positive state role in economic development, public investments in medical care and education, and an aggressive government bargaining stance towards foreign investors and the IFIs. The "bad left" was irredeemable even if its actual policies were reformist Keynesian programs like those of the American New Deal. In fact, the underlying premise of neo-liberal doctrine was to end the New Deal tradition at home and abroad, through cuts in Social Security, right to work laws, and more. Furthermore, the "good left" was at its best if it took pro-American positions in forums like the United Nations. The "bad left" was sinister if it opposed the wars in Iraq and Afghanistan, and entered into trade and commercial agreements with the Russians or Chinese. The "bad leftist" Sandinista leader Daniel Ortega fought a war against the United States, was elected Nicaragua's president in 1986, then defeated in 1990, and returned to power in the 2007 and 2011 elections. Still in power, Ortega is a close ally of Venezuela and Cuba and poster-boy of the "bad left." "Bad leftists" can be liberation theologians. Haiti's Fr. Jean-Bertrand Aristide, the first democratically elected Haitian president, was ousted in 2004 after being twice elected. America's black community and civil rights activists pressured Bill Clinton to force Aristide's return after a 1991 coup by the Haitian oligarchs. Aristide inaugurated sweeping health care and education programs while disbanding the police of the former dictatorship. The US insisted that he accept IMF reforms and abandon any further "class rhetoric." Under Bush, he was seized from the presidential palace and, with American involvement, flown to exile in South Africa. In 2011, Obama urged South Africa to prevent Aristide's return to Haiti because he represented a "threat" to Haiti's electoral process. Though he was the most popular leader in the country, American officials and media made efforts to demonize him as having links to drug rings and street gangs. Haiti remains a basket case under a kind of international receivership. Indigenous leader Evo Morales was elected Bolivia's president in 2005 against a neo-liberal candidate strongly supported by the United States. Bolivia was the first "domino" after Venezuela. Rafael Correa was elected president of Ecuador in 2006, fought the international banks over his country's debt, and closed a strategic US military base. He has been elected three times as a 21st century socialist. With Bolivia and Nicaragua, Ecuador under Correa would join the Venezuelan-inspired Bolivarian Alliance of the Americas (ALBA) in 2009. Correa also became a leader of the Venezuelan-inspired diplomatic bloc known as the Union of South American Nations (UNASUR). He has given asylum to Wikileaks founder Julian Assange and spoken supportively of whistleblower Edward Snowden. Correa survived a possible assassination attempt by police in an attempted coup in 2010. Another domino falling to the "bad left" after Venezuela, Bolivia and Nicaragua. Manuel Zelaya was elected president of Honduras, a longtime US military base, in 2006, promptly joined ALBA, proposed a grass-roots constituent assembly, and was overthrown in a military coup in 2009. Obama at first described the event as a "coup," then withdrew the label, and left Zelaya in exile as his right-wing enemies took power with US recognition. Zelaya, his wife Xiomara, and their followers have been blasted in Honduras as pawns of Venezuela. Nestor Kirchner was elected president of Argentina on a populist platform against one of Clinton's neo-liberal allies, Carlos Menem, in 2003. Kirchner died in office and was succeeded by his wife Cristina, who has been elected twice. Along with Brazil and Uruguay, Argentina has accepted Venezuela in the Southern Cone bloc known as MERCOSUR, which President Maduro currently chairs. President Kirchner recently sponsored a mass rally in support of Nicholas Maduro in Argentina. Similar solidarity events were held in Uruguay, where the democratically elected president Jose "Pepe" Mujica, a former guerrilla leader, has been president since 2010. He has adopted an ethic of voluntary poverty, operates from his longtime home rather than the presidential palace, and is another ally of Venezuela. In 2008, the liberation theology priest Fr. Fernando Lugo was elected Paraguay's first president after decades of repression and dictatorship. Lugo initiated the country's first land-reform movement in years, and was impeached by his Senate in 2012. His removal from power was condemned as a coup by Mercosur's leadership. The US was silent on the power grab. Last week Salvador Sanchez Ceren, a former Salvadoran guerrilla commandante, was elected by the closest of margins in a campaign against the right-wing ARENA party, which ran television ads warning against "another Venezuela." ARENA so far has refused to accept El Salvador's election results, suggesting that their version of "another Venezuela" might be street battles to destabilize the country's fragile government. Because of significant grass-roots pressure from a longtime solidarity movement, the US remained neutral in the Salvadoran election. This briefest of overviews should make clear that Venezuela is deeply embedded in the Latin American region as a whole, not only as an oil supplier but as a key diplomatic and political architect of continental integration and independence. Virtually all of the regions' governments are democratic in character, all enjoy full diplomatic relations with Venezuela, and all are jealously protective of their independent status. Even the tiny islands of the Caribbean have formed a Petrocaribe alliance with their Venezuelan neighbors. There is no "good left" versus "bad left" division in Latin America as constructed by US strategists and journalists. Twenty-first century socialism is democratic, diverse, inclusive of many differences, and accepts market economics as a reality, but is united on the need for democratic self-determination without US intervention. The paradox is that resurrected Cold War thinking sees an opportunity to destroy all the dominos, including Cuba, by destabilizing and wrecking Venezuela. Suddenly, the Cuban right-wing exiles in the US, in collaboration with the US government, are building strong congressional and media support for imposing an escalating spiral of sanctions on Venezuela. If they are successful, they believe that all the dominos of the "bad left" will fall, or perhaps fall into line, due to lack of Venezuelan oil, and that the regional effort at institutional integration, led in part by Venezuela, and following the dreams of Bolivar and Martí, will be set back before it can be consolidated. Twenty-first century socialism will be upended, they think, as the US regains its dominance. Cuba, the original inspiration and base for Marti's vision of "Our America", will be crippled by the loss of Venezuelan oil, face an internal uprising and be returned to the US orbit. Of course much is left out of this fanciful neo-con scenario. It is more faith-based than fact based. 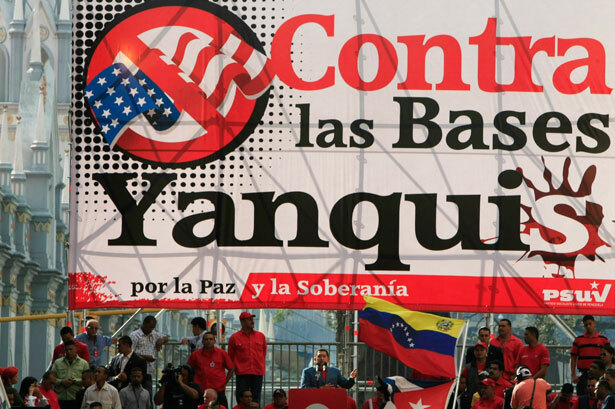 The tendency of the Latin American region to become more unified in the face of outside aggression is ignored. The provision of oil and energy resources from Russia and China, in case of a Venezuelan supply crisis, isn't factored in. The potential revolutionary chaos that would ensue from the toppling of the Venezuela government—or the fall of any of the "dominos"—seems to be accepted as necessary to the "shock and awe" economic doctrine of Milton Friedman's Chicago School. The matter of electoral democracy has to be discredited in discussions of Venezuela for this scheme to work. In neo-liberal—and now, apparently, in Congressional—thinking, it doesn't matter that Chavez was elected repeatedly, or that his successor, Nicholas Maduro, was elected president by 52 percent, or that Maduro's coalition swept last December's municipal elections by more than 10 percent. In the new twisted definition of democracy, those Bolivarian elections only proved that Latin American democracy is not reliable. The dangerous dominoes must fall before the new-type "democracy promoters" with their secret foreign funding and advice. That's what we've come to in the new Cold War. And here's the important connection for the American people. The same mentality that promotes secret schemes aimed at regime change abroad will be applied at home. How many million Americans personally believe that Obama, like Hugo Chavez, is an ape that should be caged? Ten percent? Thirty percent? That's enough for violence aimed at our elected leader. How many million Americans personally believe that people of color, homeless people, Spanish-language speakers, immigrants from Central America, poor people, high-school dropouts or prison inmates really deserve an equal right to vote and participate in our democracy? My guess is that a majority of Americans share those reservations about voting equality. Finally, how many have given up and simply accept the infection of One Percent money flowing to lobbyists, consultants, spin doctors and cover-up artists whose careers are devoted to blur the fundamental meaning of truth? And decisively, how many favor limitations on voting rights—the end of weekend voting, ID requirements for all voters, reducing polling places to induce long lines in bad November weather, etc.—if that's what it takes to keep a conservative white minority in power? Half of the states apparently. After centuries of struggling to build our imperfect but precious democracy, Americans are in danger of losing it, abroad and at home. Now that the “majority faction” has proved its ability to succeed, democracy itself is threatened with shrinkage and subversion. What goes around comes around.